Early last year my taste in home decor started to change. Normally I’m attracted to white, bright interiors with pops of color here and there. I’ve also found cottage style to be appealing and live-able. But then in January 2017 I featured the Randolph Cottage on my blog and my heart was set in a new direction. So today I thought I’d share examples of home decor I’m lovin’ right now. Here it is. The Randolph Cottage living room that got the ball rolling. The walls are still a light color which I love, because that makes the room more versatile. But the furnishings are warm wood and elegant neutrals. 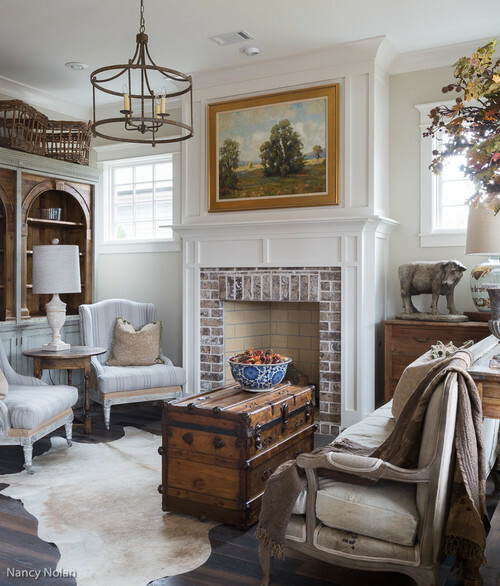 There’s also a touch of texture with a metal pendant light, rustic baskets, and a brick fireplace surround. Here’s a similar style living space. Light walls and neutral furnishings with a modern farmhouse look. Shiplap walls, fresh flowers, and a sisal rug add texture to the space. 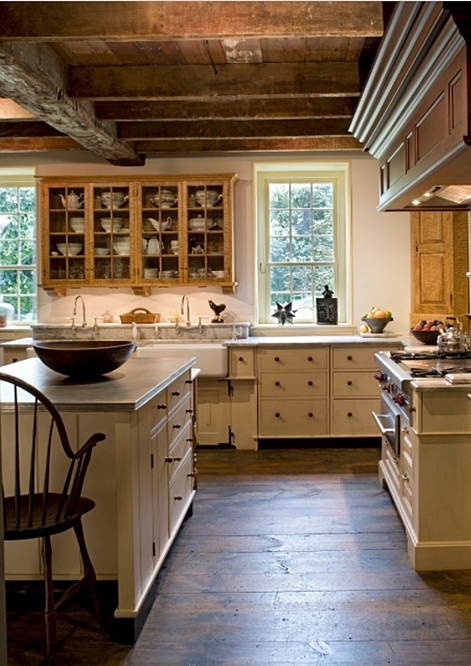 Wood beams add an air of history and rusticity to any home. And if the beamed wooden ceiling has flaws, the appeal is even better. 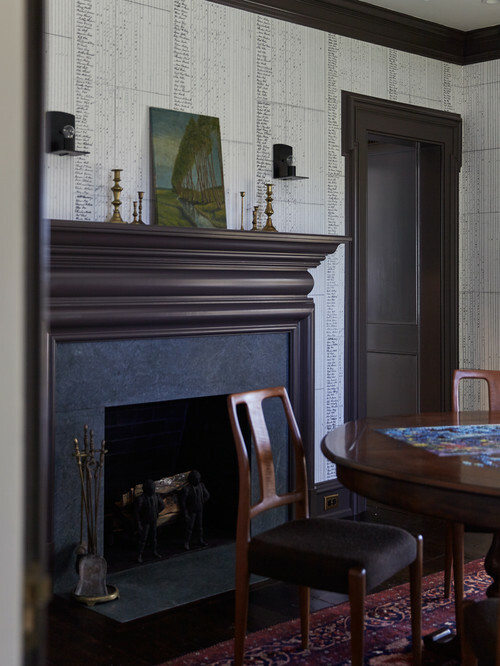 I know in months past I’ve talked about moving to a newer, low maintenance home – but I just don’t know if I can live in a house that doesn’t hold stories from a hundred years ago. Check out the beams on this ceiling – they’re tree trunks! On Instagram I’m following someone renovating an old, abandoned farmhouse. Part of their foundation is made with tree trunks. I love the history of old houses with all their unique quirks. A wood ceiling with rustic beams creates a cozy ambiance for sleeping in a pretty room (again, note the white walls and neutral furnishings). This past year I found myself transitioning from bright and cheerful cottage style home decor to a moody palette. There’s something about dark browns and shades of gray that seem to wrap you in a big comforting hug. 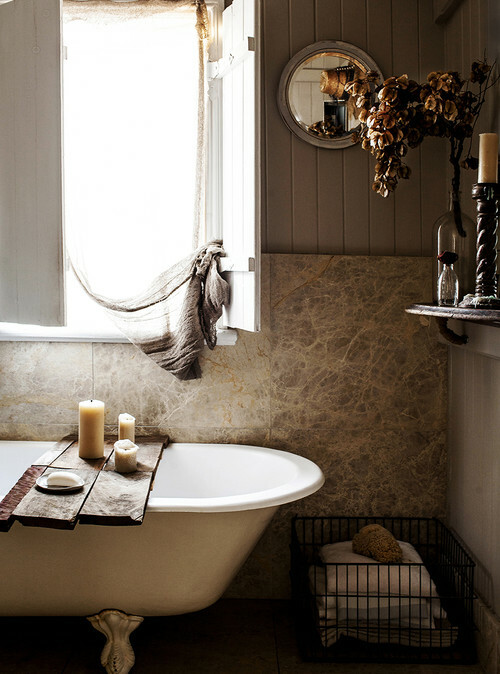 Moody palettes work well even in a bathroom. I’m in the process of re-doing my downstairs bathroom. My Provence Blue claw foot tub no longer exists! It’s now a beautiful gray and I hope to share it with you before month’s end. 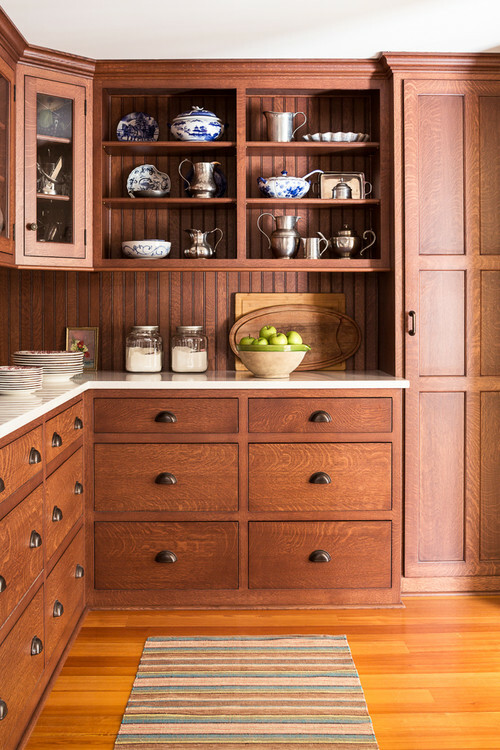 Another trend in home decor that I’m lovin’ right now is beautiful, warm wood cabinetry. Is this kitchen gorgeous, or what? I know white kitchens are kind of the thing right now, but oh – this kitchen has my heart singing! Don’t get me wrong, I still love light cabinets with butcher block counter tops, but this kitchen could easily sway me in the opposite direction of wood cabinets and white counter tops. 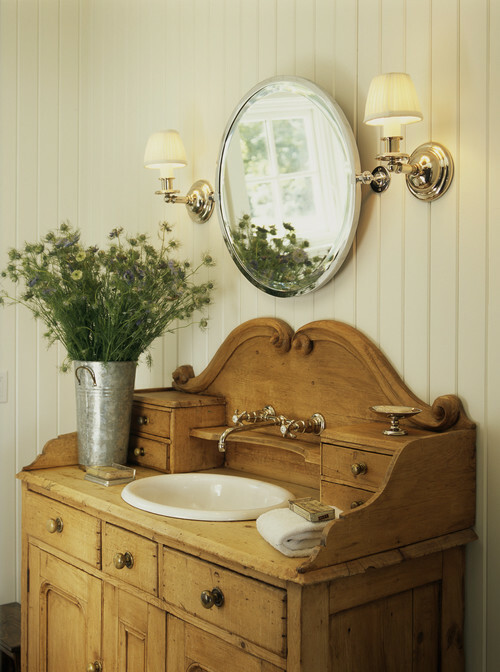 A stately vanity is yet another appealing example of rich, wood cabinetry. Such a unique piece of furniture for the bathroom. For as long as I can remember, I’ve wanted a home with a pretty staircase. 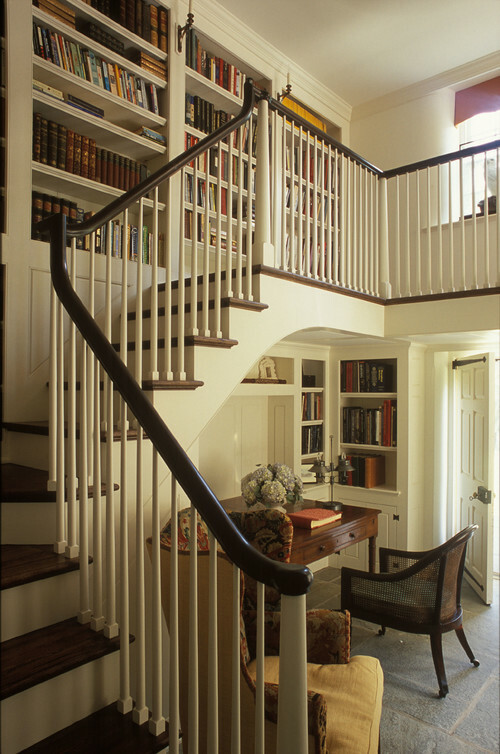 One with a two-toned stair rail would be perfect. 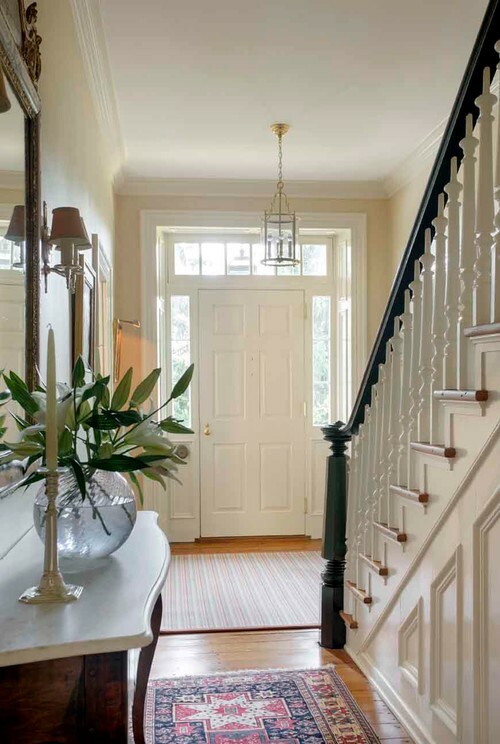 White or creamy balusters with a dark railing and newel post is perfect! Photo by Griffiths Construction, Inc.
Upholstered headboards have been popular for a while now, but I’m tossing my hat in the ring with metal beds. They have so much character and charm to add to a bedroom. 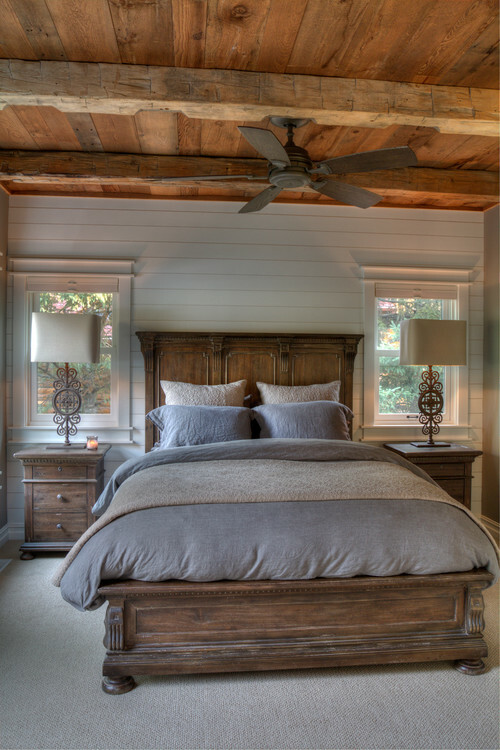 And this bedroom features another home decor aspect that I’m lovin’ right now – a rustic wood beamed ceiling! People often choose a tufted headboard to add a bit of glamour to their bedroom, but look how elegant a metal bed can be, especially when paired with a pretty metal and crystal chandelier. So I think you get the gist of where my home decor is headed in 2018. Warm woods, light walls, touches of metal, and a neutral, moodier palette – but not so moody that it appears dark and depressing. Next week I’ll share a few more bits of home decor that I’m currently crushing on. What decorating trends are you craving these days? More Good Reads You’ll Enjoy! I’m excited – I’m So Over white blue gray. Thanks! Also I was stunned to read about your symptoms – I follow health news and had never come across anything like this. Pray you are doing well. All gorgeous spaces. Thanks for sharing. I found your description with the “Moody” photo to be very telling. “This past year I found myself transitioning from bright and cheerful cottage style home decor to a moody palette. There’s something about dark browns and shades of gray that seem to wrap you in a big comforting hug.” After all of your problems with your anxiety and panic attacks, it only seems like a natural move to go away from the overly bright and glaring whites, to a more comforting palette that can help to sooth your soul. Arranging our home environment to help give our lives a sense of peace and tranquility in a crazy world is one of the best things we can do for ourselves. Wishing you the best of luck in your journey of self-care. One thing I’ve learned about myself is that my style is constantly evolving. I find myself purchasing things and making selections that I would have not selected before. 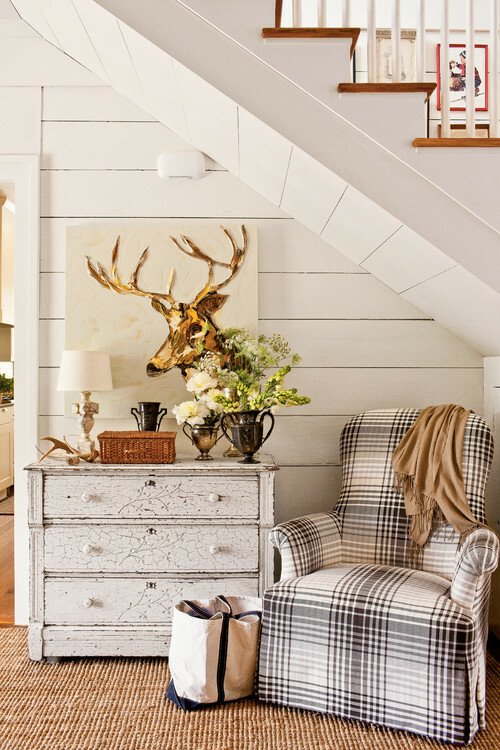 I also have always really liked cottage style with painted woods and cheerfulness prints, to soothing neutrals. 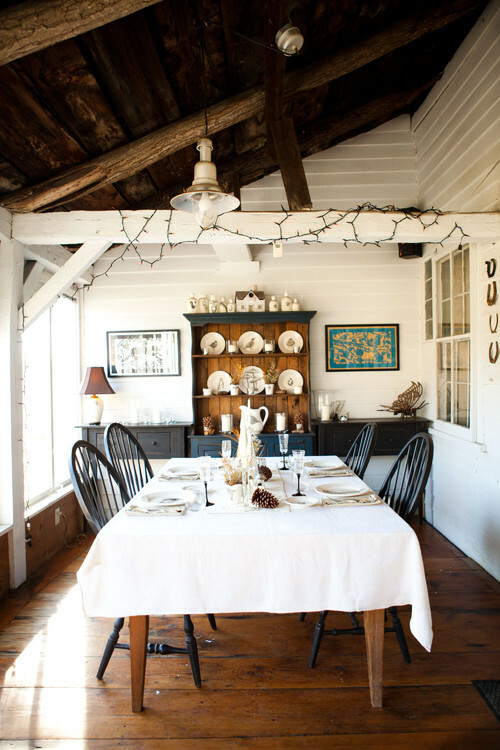 I love the coziness of the cottage décor and I would love to have a country home to do the look. My house as is, is more English at the moment ad probably will not change it, except some details on the kitchen. I love all your ideas and can’t wait to see more. I’ve been using some gray around my house and i would love to have some wood beams from an old barn for my kitchen or bedroom. Oh MY! Those are all lust worthy Rooms! Growing up in a home built by a General during the Civil War has spoiled me for anything else. But, my husband and I lived i an old farmhouses house for 7 years and that came close. What we need now is a new, one story farm type house that looks and feels old. And to win enough money to build it. So, I sit here and think about how to age my present home, and the idea of wooden beams always comes up. But in regards to your prime examples, my childhood home had a curving staircase, with a similar newel, to the staircase picture. And, a light bulb went off in regards to the blue hutch in one of the rooms. I have a pine hutch much like that one, sitting in my basement. Ive been wanting to paint it, but not sure how. BINGO! Well, I now have an idea, finding the ambition is another thing entirety. 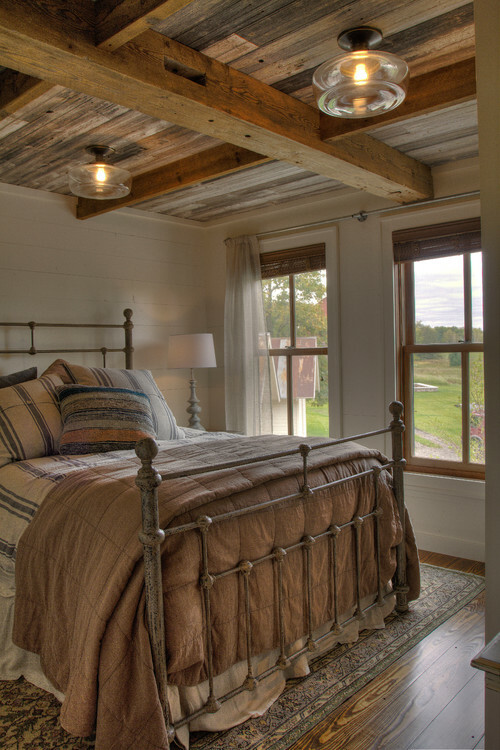 I love the Farmhouse bedroom metal bed, with the buckskin spread and blue stripe sheets, in the Randolph Cottage. What company makes the metal bed in this photo? I’ve been searching online for two days with no success.